an cooked chicken is an easy weeknight dinner. Pan cooking chicken creates that nice brown layer of flavors thanks to the pan. Always make sure to cook your chicken all the way through! This pan cooked chicken will be done in 30 minutes or less! One tip I like to follow is to salt my chicken 30 minutes before I’m going to pan cook it. You can even do this the night before and have it all set by dinner time! Salt keeps the moisture in the chicken so you don’t get that unappetizing overcooked chicken. Of course, you can skip this part but it’s just what I like to do. Just before adding it to the pan, dry it off with a paper towel. This may seem counterintuitive, but making sure your chicken is dry is the number one way to get that lovely brown outside. The lack of moisture is what gives it that brown layer. I love adding the roasted tomatoes as an extra pop of flavor. You can buy them or roast them yourself in your oven or on your gas stovetop if you have one. 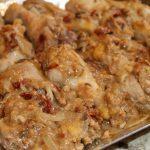 Try this pan cooked chicken for dinner! Your family will love it. Making this pan cooked chicken is so easy and quick. You'll have a fast and filling meal for your family in 40 minutes! Try this one out. Season chicken legs with salt and pepper. Add them to the oil and cook 4 minutes on each side until browned. Remove chicken from skillet and set aside. It's okay if it's not cooked all the way through at this step. Add onions, garlic, and thyme leaves to skillet and cook for 3 minutes. Add in flour and stir frequently making sure not to burn. Add broth and sun dried tomatoes. Give it a stir. Return chicken to skillet and bring it to a boil. Once boiled, bring it down to medium heat and simmer. Cook 15 to 18 minutes until the chicken is cooked through. NOTES: chicken legs can sometimes take a while to cook. They may seem pink at times but are fully cooked through. The meat closest to the bone, like legs, keep a lot of their pink color.